I have just now finally had a moment to finish watching Robert Bartlett’s Inside the Medieval Mind, Episode 1, ‘Knowledge.’ It is only iPlayer until Saturday, so watch while you can. In this episode, we are taken from the fabulous tales of the Early Middle Ages — of Dogheads (people with dog heads), sailors from the sky, men from the sea — to the discovery of the Americas in 1492. In the first half, Bartlett stresses the rational aspects of medieval belief in things we find unbelievable. The framework was of classifying and analysing the stories about such beings as Dogheads according to known knowledge. It was determined, for example, that Dogheads qualified as human since they did all the things humans did but with dogs’ heads instead of human ones. Therefore, if a Christian were to encounter the country of the Dogheads, they would be fit to receive the Gospel, unlike animal that have no rational soul and spirit. 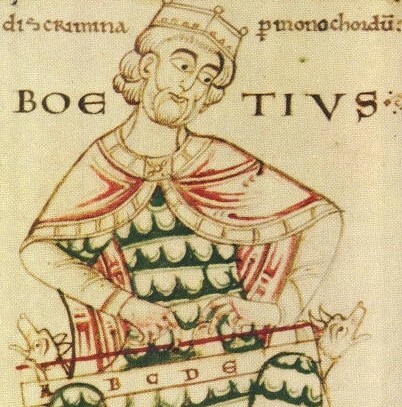 From out perspective, even when early mediaeval people aren’t being credulous, their world was one of enchantment. Everything was potentially suffused with the Divine. There was mystery lurking behind every corner. Magical and wondrous things were reported to have occurred. Another example of this enchanted world meeting with its rational analysis was the fact that scientific minds of the Early Middle Ages knew very well why eclipses happened. Nevertheless, this didn’t preclude them from looking to eclipses as signs from God. That is a point I’ll return to. The second half of the episode tracks the disenchantment of the western European mind from the founding of universities onwards. We meet Abelard in the early years of the coming Aristotelian flood, and then the problems that Aristotle’s natural philosophy presented to western mediaeval theology and worldviews — for here we meet a rational world composed with no reference to the Christian God or the Christian Scripture. How could rational explanations be reconciled with Christian belief? The answer, of course, is Thomas Aquinas. What Bartlett fails to mention is that by Aquinas’ day, there were accurate Latin translations of Aristotle directly from the Greek, rather than from Arabic which often came from Syriac first (something I like to point out). Thomas presented a worldview that said that if reason is given by God, and revelation is given by God, whatever is done accurately by reason will not run counter to revelation. He then gave us an almost comprehensive worldview that united the Christian and the Aristotelian as well as can be. After Aquinas, Bartlett discusses Roger Bacon and the origins of empiricism, then the development of clocks. We are given a taste of the exotic world encountered by Marco Polo, then sent off to America. As more and more of the Greek learning was appropriated by Latin Christendom, more and more of the mystery about the world was stripped away. The Later Middle Ages saw the rise of Scholasticism, an attempt to answer any and all questions by rational discourse and disputation. This application of reason to all things and unrelenting logic even to mysteries of Christian revelation led inevitably to a stripping away of mystery and the disenchantment of the world. I don’t think it need be that way, though. 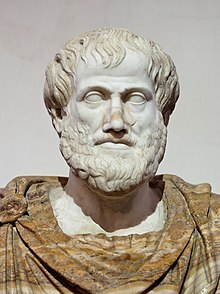 Aristotle always existed in Greek. The Greek theologians of the Patristic period and Byzantine world encountered many of the same concerns that Latin theologians had to wrestle with all over again, but they never disenchanted the world. Greek theology certainly has its eminent, logical discourses — see Gregory of Nazianzus, Basil of Caesarea, John Chrysostom, Cyril of Alexandria. But it is most famous for its mystics — Gregory of Nyssa, Pseudo-Dionysius, Gregory Palamas. Many of these men were both. Questions, therefore, such as, ‘Did the world always exist?’ need not worry the mediaeval mind. Aquinas wisely stated that this is something reason cannot answer (it still cannot, FYI; if physics has determined that what we thought was nothing is really something, it still cannot explain if that something [formerly nothing] was created or eternal; that is a question of philosophy) — we must turn to revelation. According to revelation, God spoke and things were created. And according to the Christian analysis of these things when confronted with the arguments of pagan philosophy, this was creatio ex nihilo — creation out of nothing. Furthermore, why need things have but a single origin? Is it not possible that an eclipse could be both the result of natural law and the action of the divine? Could a person by cured by medicine and the divine will at the same time? I’m not sure what the technical term is, but I call it double determination — things that are willed specifically by the divine (or other supernatural agent) but could be ascribed to natural law as well. Finally, Aristotle’s natural philosophy can teach us only about, well, the natural. One of the great errors of scholasticism was when one of the theologians (his name escapes me) decided that God was a being the way the created order is a being, rather than so entirely transcendent that when we speak of His being, it is only by way of analogy. Thus, God’s mystery is reduced. The supernatural begins to be smaller and smaller. God looks like us, just bigger (and with a white beard). However, these rationalisms are not the only necessary conclusions about the world. They cannot, ultimately, account for the vast numbers of anecdotes from Christians, animists, agnostics, Buddhists, people into Native spirituality, and so forth, that they have met any number of creatures beyond the pale of science. Science cannot account for fairies or angels — and what if both are true? Perhaps the truly open mind should begin to re-enchant the world. What if the angelic and demonic are here and now? What if there is another world, invisible to our eyes, everywhere we go? What then? What if the world is not reducible to mere laws of physics and chemistry? What if mystery lurks behind every corner? If the coming of the modern at the turn of the sixteenth century meant the disenchantment of the western mind, I hope the coming of the post-modern at the turn of the twenty-first signals its re-enchantment. This entry was posted in Christianity, History, Mediaeval, Patristics, Philosophy and tagged aristotle, enchantment, greek philosophy, inside the medieval mind, mystery, people with dog heads, robert bartlett, thomas aquinas on June 17, 2015 by MJH. In the most recent episode of the new SyFy programme Alphas, the ability of our antagonist was to overstimulate the penial gland of those whom he inadvertently turned into his victims. The result of such overstimulation was an intense, powerful feeling of happiness combined with visions of lights. The only problem is that eventually, many of those whom he thus affected ended up basically going catatonic (the word encephalitic was involved, but that’s just Greek for brain-related). This type of happiness is chemically-induced. Your brain produces the happy chemical. You feel happy. If this happy feeling were the goal of life, the result philosophers and prophets and poets have been seeking for millennia in the pursuit of happiness, then why not seek it whenever you please? I mean, why not find a drug that could make you feel happy all the time? Indeed, imagine if you could get your hands on such a drug that was even safe — no nasty side-effects, no catatonic state, no dead liver, no kidney failure. Just pure bliss. If this happy feeling were perfectly equated with happiness, there should be no problem with such a chemical ecstasy, right? Most of us do not, of course, seek happiness through drugs, legal or otherwise. Most of us seek circumstantially-induced happy feelings. We are happy and content because we just watched an interesting, action-packed, thought-provoking episode of Alphas. We are happy because we are enjoying a warm cup of tea. We are happy because we enjoy our jobs, our homes, our spouses, our hobbies, our books, our sports, our cities, our arts, our countries, our clothes. Circumstances make us happy or unhappy, even if somehow in the mysterious world of cognitive science these circumstances can make the happy chemical be produced in our brain and thus we feel happy. The philosophers, from what I have read, would counsel a different approach, neither the chemical nor circumstantial happiness being enough. They would counsel us to find a form of happiness that reaches beyond our circumstances and is able to be found without the aid of drugs or alcohol. 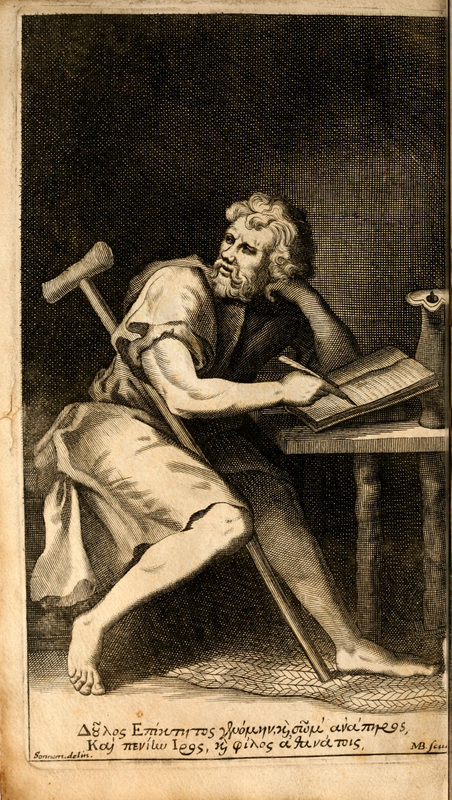 For example, the Stoic philosopher Epictetus taught that we can find happiness in any sphere of life. Regardless of the sorrows of this troublous and transitory life. we can find a deep, lasting contentment. Just because you are a slave does no mean you are not free. Freedom is found within, in your own mind, in your own attitude to the circumstances around you. Did I mention that Epictetus, unlike the famous Stoic of the next generation, Marcus Aurelius, was a slave? I’d take his word for it — though I don’t know that he spent time in the death-bearing copper mines. Still, if you’re reading a blog, neither have you. Perhaps, though, if we find ourselves grounded in something beyond the mere externals of life, our happiness can run deeper than music, literature, food, warm homes, good tea, even a great marriage alone can bring. I reckon that if we grounded our happiness in such a place, in such an approach to the world, in such a philosophical attitude, in such a quest for equilibrium, that not only might we find happiness more generally, but the pleasures and good things listed above would even deepen. Where to find this equilibrium? Aristotle, translated into Latin, calls it the summum bonum — the highest good. Aquinas teaches us that the summum bonum is God himself, the Triune God revealed in Scripture. Perhaps there we shall find happiness. I don’t know where your path to happiness is leading you. But I hope you try to seek it in something bigger and better that chemical ecstasies or the fleeting yet beautiful pleasures of this life. This entry was posted in Christianity, Classics, Philosophy, Television and tagged alphas, aristotle, epictetus, happiness, marcus aurelius, philosophy, science fiction, stoicism, syfy, thomas aquinas on September 1, 2011 by MJH.